The Cressi Leonardo is considered one of the best dive computers for beginners on the market today. So, if you are a new diver and looking to buy your first dive computer, the Leonard should be on top of your list. It sports a single button user interface which makes programming and operating the dive computer very user-friendly and pretty straightforward. A large display with over-sized digits also makes reading dive data super easy. It also has more than enough storage for your dives, as well as optional PC interface for extra storage or to get more detailed information about your dives. But what makes this an ideal entry-level dive computer? In this Cressi Leonard review, you are going to find out why it is one of the best choices for divers just starting out, its most important features, and our thoughts about the computer. The Cressi Leonard is a simple entry-level dive computer with both Air and Nitrox capability. Its Single button user interface makes navigating menus and setting quite simple and the large display make reading critical dive data easy. The computer is available in a wide range of colors to fit your individual style. The following video was produced by the guys over at SimplyScuba.com. In the video, you can get a closer look at the dive computer and some of its main features and functions. Enjoy! 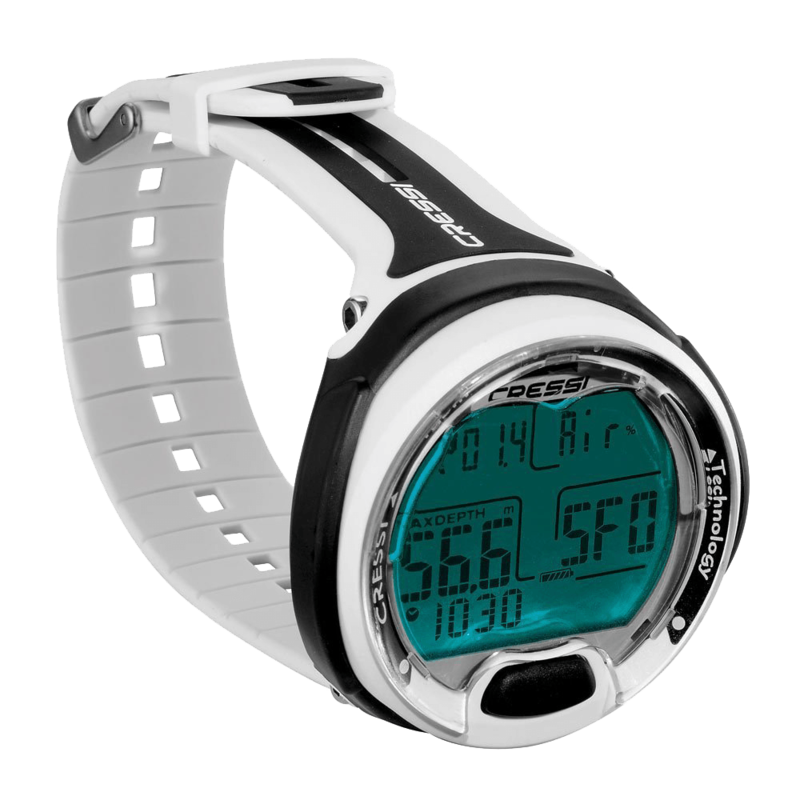 The fairly large 2 inches wide display makes all your important dive data very easy to read. It features a segmented dot matrix display with weird abbreviations and the digits are large, which takes the guess-work of intercepting what is actually being displayed on the screen. The screen can also be backlit which allows you to read the computer at night or in low light condition, and last for about 5-7 seconds. A single makes toggling through modes and setting very easy, and ensures that you won’t get lost or have to worry about memorizing multiple button combinations to reach certain features and functions. Simply press to toggle modes or advance, then hold to enter the menu or select. It’s that simple. It is also equipped with an onboard log book with can hold about 60 (70 hours) of your latest, which is more than sufficient memory if you’re just starting out. You can also easily download all your logged dives to your PC or MAC with the optional PC Download Interface Kit. Once downloaded, you can see more detailed dive profiles including colored graphs. 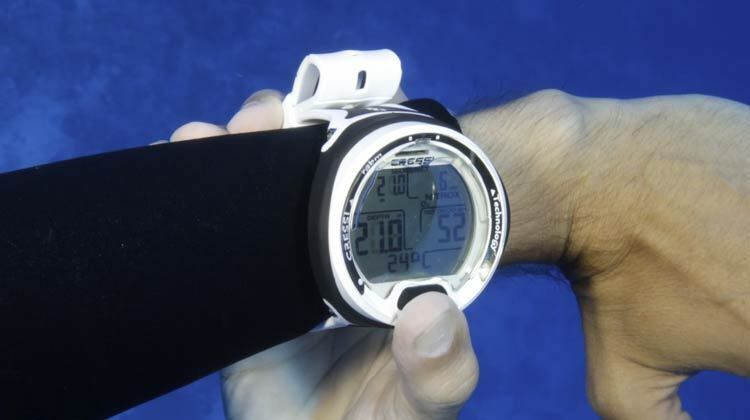 Having this additional information can help you become a better diving by allowing you to see critical dive data not displayed on the computer. We feel like the Leonardo delivered as advertised. The single button interface and the large screen makes the dive computer simple to program and read. Operating the computer is done with presses and hold of the button. The button is also quite large and easy to press, even if you’re wearing thick gloves. It’s so easy you can grasp the main operation of the dive computer without reading the manual. However, it does come with a comprehensive owner’s manual if you ever lost or need help. We really appreciated the ability to download dives to your PC or Mac for more detail dive profile and the ability to add additional information to the log. Although it does not have gas switching capabilities, it still works well with Nitrox. The Cressi Leonardo is a very basic dive computer and has all the essentials you need for a recreational dive computer. However, it lacks feature a more advanced diver would require. Although, the single button operation is very simple to grasp there was no back-step feature. If you skipped a menu option, you will have to cycle through all the other options to get back. This can be a little frustration at times. The Cressi Leonardo dive computer is a great little dive computer designed for entry-level divers. So, if you are a diver just starting out, this is definitely a dive computer to take a look at. Also, if you’re a seasoned recreational diver and prefer a more simple dive computer that’s easy to use or just a backup, you might want to consider this dive computer as well. Although, it might lack more advanced features of a pricier dive computer it still has all the capabilities you will need as a recreational diver. Rugged Design with easy to read display. Segmented abbreviations can be tricky to understand at first. Has only the essential for basic recreational diving, nothing more. A simple user interface and single button operation makes it a breeze to use and operate. Inexpensive. It is reasonably priced for the features you get. Does the Cressi Leonardo have a safety stop countdown timer? Yes, It does have a safety Stop countdown. However, It needs to be turned on in the settings. The Leonardo is powered by a User Changeable CR2430 3 volt battery, which should give you an average of 2 years battery life (About 50 dives per year). Is the download kit Included? No, you will have to buy the download kit separately. The Leonardo is one of the best dive computers for new divers or those who prefer simplicity. It delivers as advertised and priced at a point that won’t break the bank. Many advanced divers might find it too basic thou, as its algorithm is on the conservative site and lacks features such as air integration and multi-gas switching capabilities. However, it’s still one of the top recommendation for an entry-level dive computer.